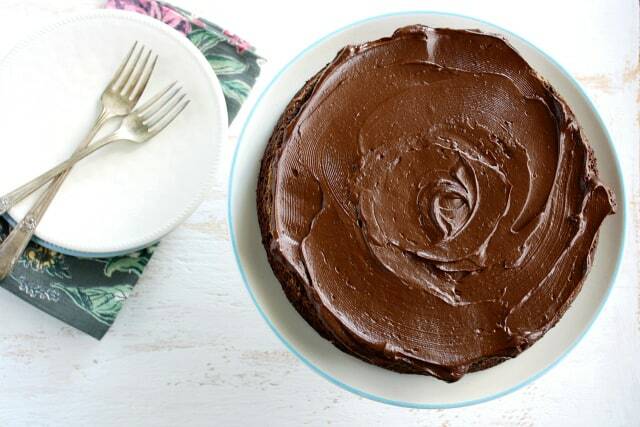 Home » Vegan » Chocolate Beet Cake with Chocolate Avocado Frosting. 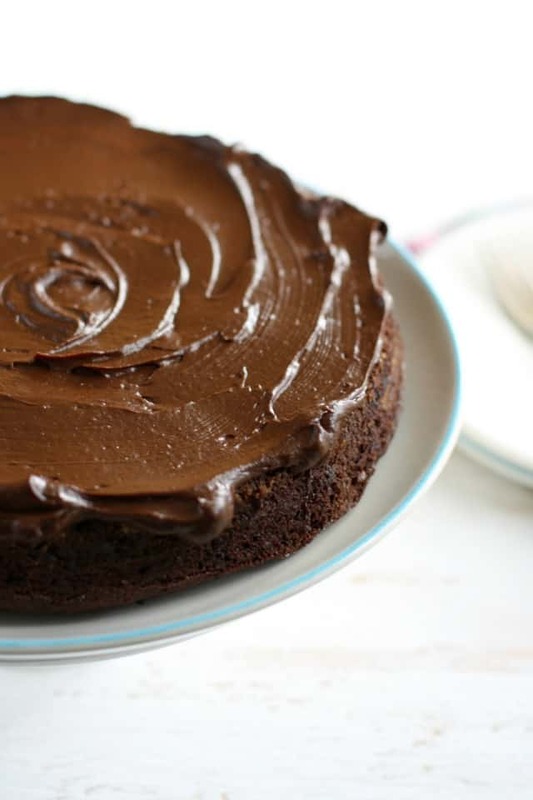 Gluten free and vegan chocolate beet cake is topped with a rich yet healthy chocolate frosting made from avocadoes. A delicious, healthier dessert. It seems like a chocolate kind of day. Doesn’t it? Is it just because it’s Monday? Is it because it’s getting close to Halloween and everywhere I go it’s candy, candy, and more candy? Who knows. 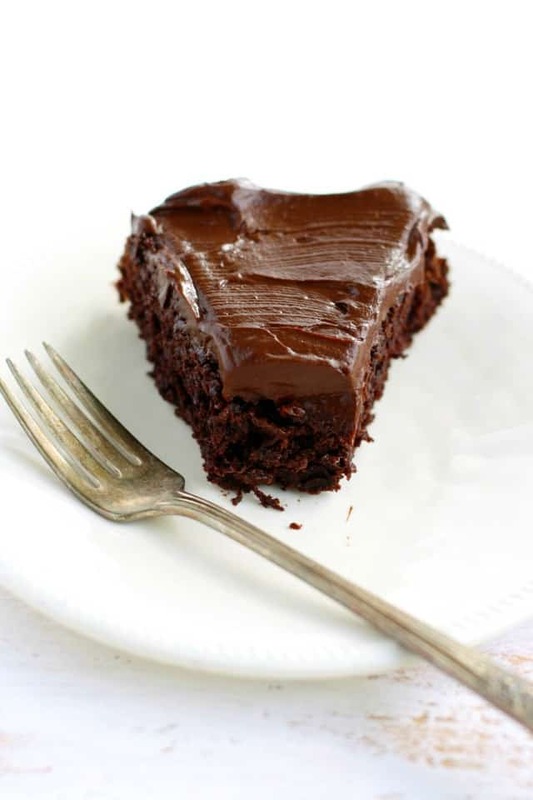 Either way, I have a healthier vegan chocolate beet cake recipe for you with my sneaky chocolate avocado frosting on top. It’s soooo good, and the frosting even fooled my seven year old, who can usually spot secretly healthy treats a mile away. 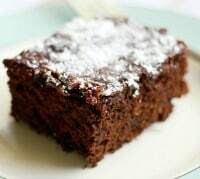 This is very similar to my easy vegan and gluten free chocolate cake recipe, but with the added benefit of some beet puree in the batter. You can’t taste or see the beets, and they add a little more fiber and some antioxidants to a very decadent dessert. I just boil a beet or two and then blend in the food processor to make beet puree, but if you wanted to save time you could find baby food beets and use those instead. If you’re out of beets, or hate beets, or are afraid of your hands turning purple, you could easily use another fruit puree. Prune puree would work, as would unsweetened applesauce. But since I’m not a huge beet fan, I like to hide beets in desserts when I can! That way I can still get some of the benefits. I did use a gluten free flour blend in this recipe (Enjoy Life Foods Gluten Free Flour, 123 Gluten Free Flour, or Living NOW Foods Gluten Free All-Purpose Flour would all work). 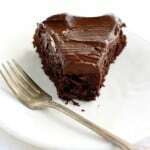 You can also make this chocolate beet cake with regular flour if you don’t need it to be gluten free. 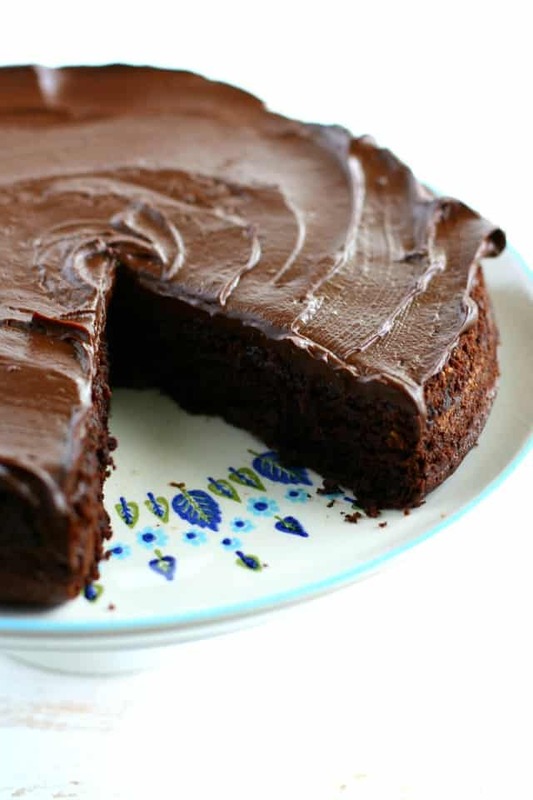 A decadent chocolate cake made with beets and topped with a rich chocolate avocado frosting. Preheat the oven to 350 degrees. Lightly grease and flour a 9 inch round cake pan. Add the organic canola oil, beet puree, water, and apple cider vinegar. Mix batter by hand. Pour batter into prepared cake pan. 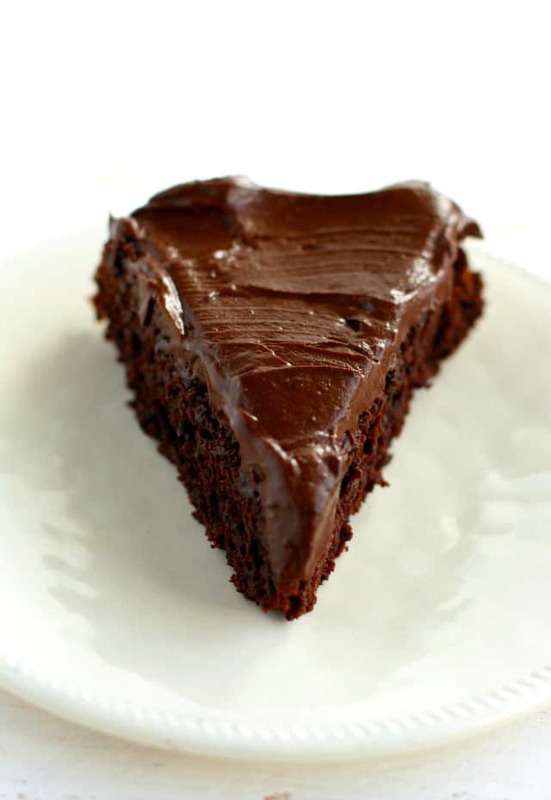 Bake at 350 degrees for 35 minutes, or until a toothpick inserted in the middle of the cake comes out clean. Let the cake cool in the pan for about 25 minutes, then run a knife around the edges of the cake and invert the pan to remove the cake. To make the frosting, combine the avocados, maple syrup, and cocoa powder in the food processor. Process until very smooth. Taste it, and add more maple syrup if needed. Frost the cooled cake and then store the frosted cake in the refrigerator. To make beet puree, peel and chop one or two beets. Place in a pan with enough water to cover. Bring to a boil, then reduce heat and cook until beets are tender, about 20 minutes. Let beets cool, then place in a food processor with 1-2 tablespoons of the beet water. Process on high until smooth. Sometimes people wonder about using avocado in desserts. It really does taste good, but you have to use a perfectly ripe avocado. You can’t use one that’s starting to head south, because it will just taste like an overripe avocado, and that’s no good. A perfectly ripe one will not have any kind of taste in the frosting, it will just be super rich and creamy. If you just want to skip the cake and enjoy the topping, try this chocolate avocado pudding recipe. Are you a fan of hiding vegetables and fruits in your desserts? « Mujadara (Lentils and Rice). I have used Enjoy Life GF Flour, Now Foods GF flour, and my own recipe that you can find on my site. My recipe is gum free if that is helpful! This looks perfect for someone I know, except for the sugar. Is there a way of substituting it for something natural and doesn’t involve coconut? Such as dates, agave, maple syrup etc please? I haven’t tried that, so I am not sure. If you try it, let me know! Hello, love the recipe. can I use regular flour? What do you think? Thanks! Hi! Could I use oat flour instead of the gluten free flour blend? You can try that, but the cake may be denser. Hi! I made this for my sons birthday back in May and it was a hit! My daughter asked me to make it for her daughters second birthday 😊. That just came out of the oven but I also want to make some cupcakes. Should I do anything different? Wondering if they’ll ride enough? what is the degrees in celcius please? I am not much of a baker but have a child’s birthday cake to make free of dairy as it inflames her eczema. I also like the idea of hiding avocado! Here is a converter: https://www.unitconverters.net/temperature/fahrenheit-to-celsius.htm It looks like 176 degrees? Does that sound right? OK, I have made one beet cake that was full of sugar, but everyone loved it. I am going to try this one now. Looks and sounds amazing. I just put this in the oven, but I wonder if the batter is suppose be very thick – mine is. The batter is a thick batter, but you can always add more liquid if it seems too dry. JUST finished making this cake…..SOOOOOO GOOOOD!!! I’m not vegan but when we found out my mom had Parkinsons we started trying to eat better in every way…..She has a hard time tasting things these days as well. I do not so I tried it first just to be sure..ITS NOW OUR NEW FAVORITE DESSERT. Thank you so much for this recipe and the avacado icing is so amazingly creamy is insane. Thank you a million times from the bottoms of our hearts! WHY can’t I print your recipes from my iPad? Recipes appear blacked out! Does it matter that you have ads on your recipes? We have Apple equipment and HP printers. I have made this cake 4 times and about to make it again! Its delicious and never flops. Thank you so much! Hey there! I was wondering why you add apple cider vinegar to this recipe? It helps the batter rise. Since this is egg free, it needs a little help! Made this cake today. My hubby, who by the way hates any kind of veggie but green beans and corn, thought this was pretty good. I am not crazy about the frosting but I think tweaking the sweetners would help. All in all this is a very rich chocolate yummy dessert. Thank you for sharing, glad you liked it! I had all these avocado recipes ion my Pinterest page this afternoon and yours caught my eye. The recipe looked good but your serving dish brought a smile to my eye. I have a platter with that same pattern which belonged to my mother. Such a surprise to see it on Pinterest! ? Such a fantastic recipe! I made this cake over the weekend for a healthy dessert. I used agave nectar instead of maple syrup and swapped the sugar portion for 1/2 coconut sugar and 1/2 applesauce. I also made a 2 layer 6 inch cake….and it turned out fantastic!! It’s certainly not a traditional chocolate cake, however everyone that tried was completely satisfied and intrigued with the amount of fruits/veggies included! Thank you for sharing, I will definitely be making this bad boy again! Thank you so much, Amie! I’m so glad to hear this was a hit! Your changes sound wonderful! Do you have a calorie count for this cake with the icing? I’m sorry, I don’t. There are a lot of good calorie counters on line though! What a healthy dessert! I could eat this completely guilt free. Heck, even 2 slices! haha! Every day is a chocolate kinda day and mondays are no exception! This is by far the healthiest cake I have ever laid eyes on that actually looks DELICIOUS!! Oh my goodness I am blown away right now. Can not wait to try this out!! It is ALWAYS a chocolate kind of day in my book. :) This cake has my name written all over it. I love that you used beets and avocado! Pinning! SOLD! I want to abandon my midterm studying and go bake NOW! This looks incredible…I’m not sure how you do it! I think the second most memorable dessert I’ve ever had was a chocolate and beet dessert at Lazy Bear. I’ve been thinking about it for months… and now I’m going to have to try this to get over the craving! Dying to try this. That frosting looks amazing. Yeeeeeeeeesuuuuuuh! Chocolate beet cake is my jam! I made one a few weeks ago and am still swoonin over the thing. That avo frosting looks and sounds marvelous, too. This cake would last roughly 3.4 seconds in my house! You had me at beet cake! This looks gorgeous, Kelly! I’ve never made a sweet treat with beets before, so I’m definitely intrigued. Sounds delicious!